Starch is the most common carbohydrate in human diets and is contained in large amounts in staple foods like wheat, corn, potatoes and rice. The leading starches used in all 2017 food & beverage launches tracked were corn starch, potato starch, and wheat starch. 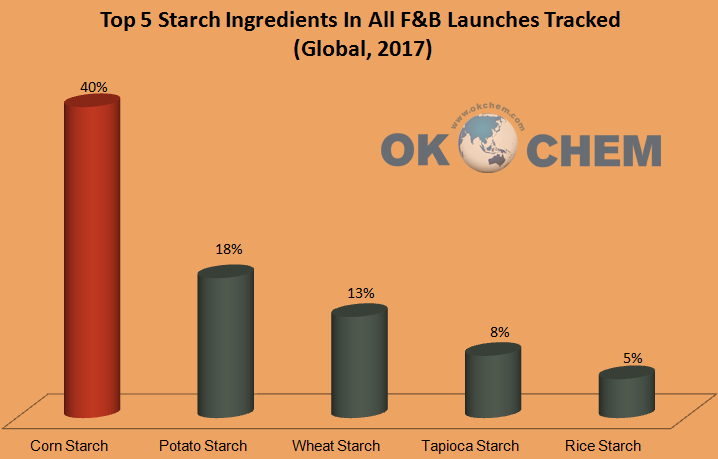 The use of starches grew by +5.1% globally in 2017 vs. 2016, and as the leading starch ingredient, the corn starch market is projected to grow at the rate of 5.7% during the forecast period, 2018-2023. High demand for natural and clean label products will be the major driving growth of the corn starch market. 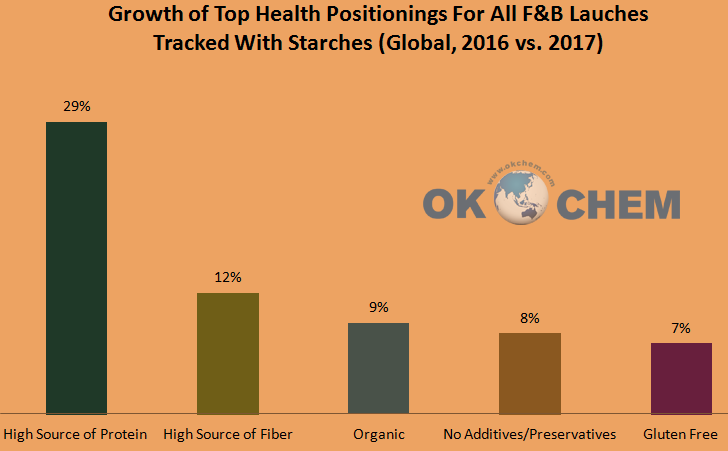 And the top health positionings for all food &beverage launches related with starch are as below. In the international market, North America maintains its leading role due to the high consumption of processed and instant food products in the region. The abundant corn resources in the country and the low prices of the corn starch contribute to the growth of corn starch industry in US market. On the other hand, Asia-Pacific is expected to grow at the highest CAGR during the next five years. The rising health consciousness among consumers and the high demand for the natural, pure, and high quality products have generated the demand for clean label corn starches. As one of the most important sectors of the corn deep processing industry in China, corn starch industry saw a healthy development in recent years. The current inventory is equivalent to the same period of last year. In the first half of 2018, there was a cumulative process since the Spring Festival but in the second half of the year, the consumption peak, shutdown maintenance and the environmental protection inspection may cause the inventory to gradually steady down. 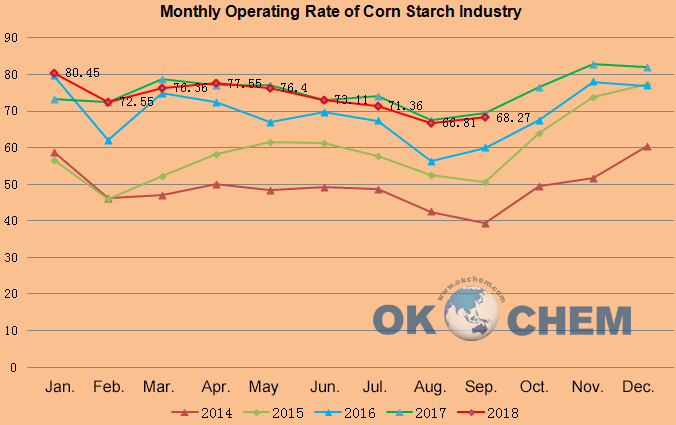 Starch production during September was significantly more stable than the same period of last year, reflecting the supply increase by new production capacity since the end of 2017. The exit curve since the Spring Festival is relatively stable and slightly higher than the same period last year, indicating that downstream demand is relatively stable. The trend of consumption coefficient from October to December may be different from the previous years, the curve fluctuation will tend to be flat and equivalent to last year, but the monthly consumption is higher than the same period of last year. As September to November will be the consumption peak period, the annual consumption may reach 27 million tons, exceeding that of last year. The operation remains at a high level. This year is basically in full-capacity production, almost the same as last year. The operation rate after June was slightly lower than that of last year, which may be caused by environmental protection and the impact of the SCO Summit. 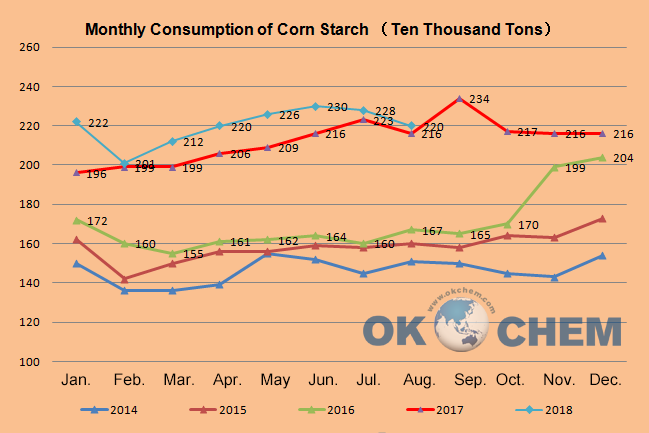 However, with the increased new capacity since the end of 2017 and the current operation status, the general volatility rising trend of the starch will not be affected. The spot price of corn starch is stable in the Northeast China with the price at 2,350 to 2,450 Yuan per MT; but it has been rising steadily in North China and Shandong Province due to the corn price increase, with the price fluctuating at 2,520±50 Yuan/MT. And in the long term, the price may keep the volatile rising trend before 2020.